Debate: What are your beliefs on the end of the world? I thought I might start a discussion, please tell me if this is against the rules. I believe that there are many natural causes that may lead to a destruction of the civilization we have now. In some ways, actually, I don't find it frightening, a more conscious, connected people may arise, and the planet constantly evolving makes it impossible for all life to be utterly destroyed until the death of our sun or some other cosmic event intervenes. I don't really believe in any of the doomsday predictions, however, it just makes no sense how it would come about, and they have been proven wrong time and time again. You mean the end of the Earth, or the end of the universe? Or the end of humankind? Th end of the world as we know it, as in popular imagining. Well Im not trying to be religous on my first day but. I do belive that the world might end. to say the world is going to end im not going to say who it is its just in what every one belives in or doesnt belive in it on the decion we as humans make to ruin or keep this world happy or either safe! I think that by then we will have discovered more advanced forms of space travel, and possibly another life supporting planet. But, there would probably not be enough materials to save everyone, so many will die and our population will likely be halved or more. Also, the world will probably not end until everyone alive today will be long dead of old age. When the sun dies out. Or explodes. After two years we will all die. An economic collapse within America and major inflation to follow. WW3, which will start within the middle east. Destructive seismological activity around fault lines and along the continental plates. All of these would result in major changes living resulting in "the end of the world as we know it", not an actual end of the world. Aiee, my opinion is kind of religious and I don't exactly know everyone here so I rather not say. I don't believe that it'll happen in 100 years by now, and I doubt it is happening around this time period. I try not to think about it and try to think optimismly (or positively, however you spell it) about the earth so yeah. This. I don't believe that the world will end on December 21st, 2012, but I think that what Relora is saying is likely very likely to happen. All of these predictions that the world will end on a specific day are stupid, since "the end" can't happen that fast. However, I think that if the world is bound to end soon, Relora is right. I dont think a world war will end humanity. Our race is stupid, but not stupid enough to just destroy the entire planet. Who benefits? The only way I could see humans killing off their own race is if germ warfare is used in some sort of war or by some insane terrorist. Besides some of the things Relora said, there's also the chance of overpopulation in a world power, resulting in shortage of food, water, etc. that can in turn trigger a fight between countries for vital resources, but again I dont think something like that would kill ALL of us. So yea, I personally dont think the world will end by our own doing, at least any time soon. That's of course not including the long term effects that our actions might have on the planet. Anyway, I think mother nature or a worldwide plague will end up killing us off. i think we will lose gas and oil (without oil no electricity or cars) in the future we all know that a lot things are gonna be electronic (no books just tablets, no chalkboards just smart boards for school) without cars no jobs. No jobs no money. No money no food or shelter. If you don't understand what i am saying read the book called Empty it is book about 10 years from now. it talks about the world without oil or gas. Some time in the future, we will discover space travel and at one point, no humans will be left on earth. Some time after that, the sun will expand and burn the Earth. @rebekham: First of all, humans discovered space travel decades ago. Second of all, your post makes just about no sense. Its not impossible to survive without gas and oil. I think it's going to be like all the other times you hear "well hey, did you hear that the worlds going to end" and then people freak out and right when you hear it's not coming then there's peace and then this is happening is kinda making me filll wierd like this isn't going to happen but at the same time i just really don't care because i wanna see my sister again and grow wings. I see your point, but it's not just "World War Three" I'm referring to. I'm positive that Relora is right about the destructive seismologic contributing to "the end of the world as we know it", too. But although I strongly do not believe that there will be a World War Three this year or anytime soon, I never did say that I think the world will end soon. In my above post, I said that the world is seriously unlikely to end quickly or on one of the specific predicted dates, but that it will take time to collapse. Maybe in that amount of time it takes for the world to end, we will have a World War Three over something such as vital resources, like you said. Although it would not kill everyone, it would contribute the world's end. However, I completely agree with you about nature being a huge contribution to the world ending. For one, it's already happening is parts of America with all of these Wildfires. And like I said, I'll bet there is a lot of destructive seismologic activity to come. And you know, fires, hurricanes, "the works". But yeah, pretty much sums up what I think can lead to Earth's "doomsday". The world will have ended by the time I have listed all of my theories and explanations for the apocalypse (no idea how to spell that). I will create a brief list of my most thoughtful explanations. 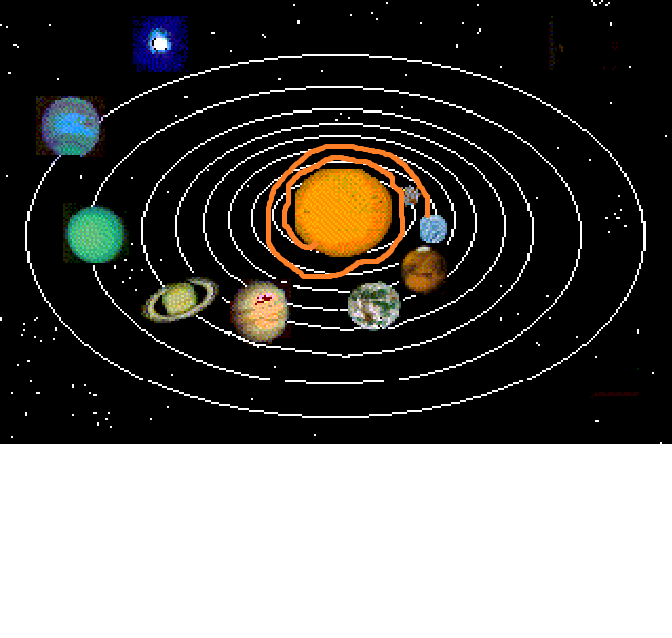 - Each time the earth completes a rotation around the sun, it moves in just a little bit closer. Eventually, the earth will be swallowed into the sun. Obviously this picture represents the earth being engulfed into the sun in extremely elapsed time. - The existence of a black hole in the center of our galaxy has always been the subject of debate. I believe that it does exist, because the planets are being drawn in my some kind of force. However, this process happens very slowly. In billions of years, several scientists predict that the earth will be sucked into the black hole. - A future lack in oil could lead to a worldwide disaster. America will be livid, and they will be incensed with the middle east. America and the middle east will restart their fight, which will result in World War 3. World War 3 has the potential to pollute oceans, destroy islands, set fire to the rainforests, and say goodbye to the world as we know it. By the time this has ceased, something else caused by the human race and their unthoughtful actions and the aftermath of World War Three will have caused the world to end. While the end of the world will most likely not happen for a long period of time, we must try to prevent it. We can prevent it by preserving our world. Clean up our oceans, stop forest fires, etc. As for World War 3, we must prepare for it. Shelter the locations from which we obtain our vital resources. This way, despite the fact that the world might be hideous, we will be able to survive. Although there are innumerable explanations for an apacolypse, I recommend that we not worry about the end of the world as it will not happen for a long, long time. Enjoy the world while we have it! I think that the idea of the world ending would never be here is the movie "2012" never came out. I know that after a long time after there are no humans left, or we are all dead (unless someone has a world record of living, lol) it will be the end of the world because of the sun in 3,000 or something like that. I simply don't believe the end of the world, at least not now of course! It will end in probably millions of years. Plus, we already discovered space travel and nobody know if the world can end today or tomorrow or next year. Even scientists don't know, its their hypothesis. We all have our beliefs. There is no man upstairs as 'God' doesn't exist. And without scientists, we wouldn't be alive today. What happens if there's a cure on another planet that scientists discover to be the cure to cancer? There is a HUGE range of scientists, and only a small aspect of that covers germs. Without science, we wouldn't have the light bulb, electricity and much more things our world wouldn't be able to survive without. Subject: Re: Debate: What are your beliefs on the end of the world?